Wai Shing Cassette Tape Mfg., Ltd.
Wai Shing Cassette Tape Mfy., Ltd., a member of Wai Shing Group, is a manufacturer of Video Media, Multimedia Discs and Multimedia Packaging products. Founded in 1977 by our Chairman, Mr. T.Y. WONG, Wai Shing was concentrating on producing audio cassette tapes. In 1984, Wai Shing turned the focus to video cassette tapes production as the market changed. Due to the strenuous work and experiences from the top management leaders down to the general staff, Wai Shing fastly became a reputable manufacturer in the video cassette industry and established long term partnerships with several international enterprises. Because of its superior quality and strict compliance with the Victor Company of Japan Ltd. (JVC) specifications, Wai Shing obtained the license from JVC for producing video cassette tapes and since 1987. From 1988 to 1993, Wai Shing opened a total of 3 factories in Shenzhen, China. High quality and efficient equipments, including over 200 sets of plastic injection machines, winding machines, packing machines and QC equipments from Japan and Europe are used in the factories. With a well trained production team with more than 2,000 staff and workers, and the serious inspection of every production stage by the management leaders, we assure that our products are the highest qualified and accurately delivered to our customer. Furthermore, our factories in China have all received the certificate of ISO 9002. In order to keep pace with the ever-changing demand in the current multimedia market, Wai Shing has been continuously investing tremendous resources in other categories in the late 1990’s. 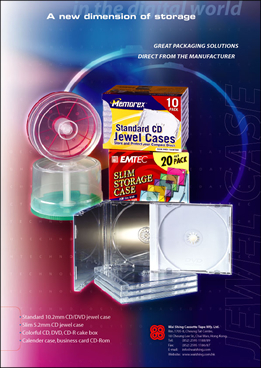 A sister company, Finex Disc Technology Limited was setup to produce CD-R, CD-ROM and VCD, as well as multimedia packaging. DVD Recordable Dics is also under development which will be introduced very soon. Today, Wai Shing is one of the most famous manufacturers in the video and high qualified manufacturer of video cassette tape, optical discs and multimedia packaging products. Most of its products are produced on OEM basis under renowned brands. We provide multimedia products to a number of famous brands in the market such as JVC, Sony, Panasonic and Konica. Our products are also provided for overseas markets including Japan, USA, South Korea, Australia, and European Countries etc.